The impasse in Washington grows more shocking by the day. No, it is not surprising that it came to this -- many expected some serious fights between a Democratic congress and President Donald Trump’s White House. It is stunning though that still no one seems to know how this is going to end and hasn't since Day One. Now on Day 32 of this partial government shutdown, the president is still tweeting at Speaker Nancy Pelosi, but he doesn't appear to be talking to her. Likewise, while Democrats might have been unmoved or even insulted by the president's offer, so far their only concrete counter has been to open the government and negotiate later. As Sen. James Lankford, R-Okla., told ABC News' Martha Raddatz on "This Week" Sunday, the lack of trust cannot be overstated. Perhaps, at some point, a new kind of leadership could emerge that's less focused on keeping a base united and more motivated to move the country forward. Sen. Kamala Harris (D-CA) speaks to reporters after announcing her candidacy for President of the United States, at Howard University, her alma matter, Jan. 21, 2019 in Washington, D.C. Almost two years to the day since Trump took office, the Democratic field vying to defeat him seems to be expanding exponentially. With that expansion comes the very real challenge of crafting a campaign message that's able to break through in a hyperactive media landscape, untangle policy proposals and stand out among statements from a field of candidates that could number 20. The crop of Democratic candidates emerging is clearly diverse, but this week's activity shows just how varied the messaging on specific issues will be, and how each candidate will face his or her own unique difficulties in honing in on a central message that breaks through the campaign clutter. Massachusetts Sen. Elizabeth Warren heads to Puerto Rico on Tuesday to meet with local officials about the island's recovery from Hurricane Maria, while Washington Gov. Jay Inslee -- who has not officially declared a White House bid -- heads to New Hampshire for a conversation with college students on climate change. 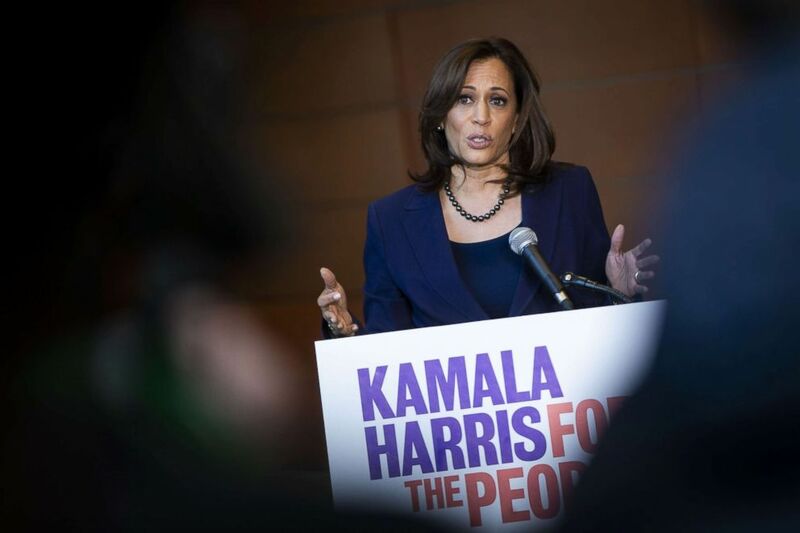 With Sen. Kamala Harris' campaign announcement on "Good Morning America" likely to garner most of the attention this week, the path forward for Democrats hoping for their own moment in the political spotlight may be to highlight issues often on the periphery of the debate. Whether or not issues like climate change will enable candidates like Warren or Inslee to break through remains to be seen. Sen. Mitch McConnell is expected to try to start a debate as early as Tuesday on a bill that encompasses the president's wall/immigration proposal, funds the quarter of the government that has been shuttered, and add sweeteners, like $12 billion in disaster aid and an extension of the Violence Against Women Act. Democrats are mostly united in their position that Trump should open the government before the two sides negotiate on border security. An aide to Sen. Joe Manchin, D-W.Va., said the senator is open to the president's proposal but wants to see the final bill before deciding how he'll vote. 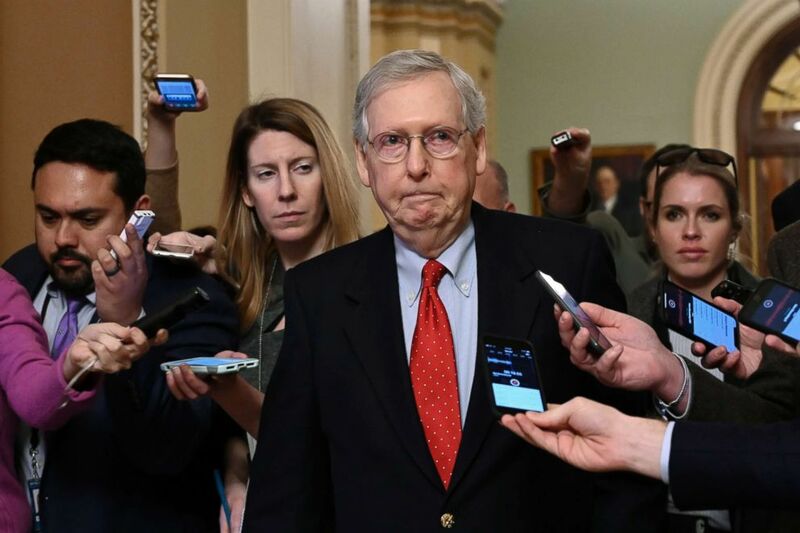 Aides said the Senate majority leader was still settling on a procedural strategy, with Republican leadership whipping its members on Saturday, according to a GOP aide. But given Democratic opposition, McConnell doesn't appear to have the 60 votes required to advance the president's proposal. Meanwhile, aides to a bipartisan group of negotiators said they expect the group to continue their talks this week, despite a bit of a setback with the president’s weekend announcement and Republicans who are intent on backing Trump. The Senate convenes and resumes consideration of the motion to proceed to "S.1 - Strengthening America's Security in the Middle East Act of 2019" at 1 p.m.
Washington Gov. Jay Inslee speaks with college students at Saint Anselm College and Dartmouth College on the need to confront climate change at 8:30 a.m. and 1 p.m., respectively. Former Democratic Rep. John Delaney, who is running for president, speaks with students at the University of Chicago at 3 p.m.
Sen. Elizabeth Warren, D-Mass., holds a community conversation in San Juan, Puerto Rico at 6 p.m., local time. Sen. Cory Booker, D-N.J., holds a "Cocktails & Conversation" in support of "Booker for Senate" in New York at 7 p.m.